During femoropopliteal bypass graft surgery, a vein or an artificial tube is used to create a bypass around a blocked main leg artery. The blocked arteries in the legs are usually caused by a buildup of plaque. When this buildup occurs, it is called peripheral arterial disease (PAD). If advised by your doctor, take antibiotics to prevent an infection. Arrange for help at home after the surgery. The night before the surgery, have a light dinner. Do not eat or drink anything after midnight. The doctor will make a cut in the skin on the leg. Through this cut, the doctor will take out a vein that will be used to make the bypass. If the vein cannot be used, then an artificial vein is used. Next, an incision will be made in the groin to expose the femoral artery. This is the artery in the thigh. The doctor will make another incision at the back of the knee to expose another artery. This is called the popliteal artery. The doctor will use clamps to block the flow of blood through these two arteries. One end of the new bypass vein will be stitched into the femoral artery, and the other end will be stitched into the popliteal artery. Once attached, blood will be passed through the graft to check for leaks. If leaks are found, the doctor will repair them. The clamps will then be removed. 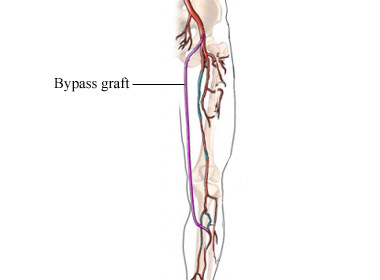 This will allow blood to flow through the graft to the lower leg. The doctor will use stitches to close the incisions. In some cases, a vein in the thigh will be used as a graft while left in place. This is called in situ. In this procedure, the valves inside the vein will be removed with a small scope and a small cutting tool. The vein will then be attached to the arteries to form a graft. Fluids and pain medications by IV for the first 24-48 hours. An oxygen mask for the first 10-12 hours. An epidural in your back to numb the site and relieve pain may be left in place for the first 3-5 days. As you heal and the swelling in your leg subsides, you may have pain for weeks or even months. Pain can be managed with medications. Keep in mind that it is normal for your leg to remain swollen for 2-3 months. Use ice packs to decrease pain and swelling. A nurse will apply a cold pack to the area for 15-20 minutes each time. Wear boots or special socks to help prevent blood clots. Use an incentive spirometer, to breathe deeply, and to cough frequently. This will improve lung function. Watch the wound for signs of infection. It may take up to 4-6 weeks (or more) to feel pain free. If advised by your doctor, walk every day to make your legs stronger. You may be referred to a physical therapist to help with exercises. At home, you will need to take care of the wound to prevent infection. Your doctor may advise lifestyle changes, such as quitting smoking and a eating healthful diet. Lower extremity bypass surgery. USCF Department of Surgery website. Available at: https://vascular.surgery.ucsf.edu/conditions--procedures/lower-extremity-bypass-surgery.aspx. Accessed November 30, 2017. Peripheral vascular bypass surgery. Encyclopedia of Surgery website. Available at: http://www.surgeryencyclopedia.com/Pa-St/Peripheral-Vascular-Bypass-Surgery.html. Accessed November 30, 2017. Surgical bypass. Society for Vascular Surgery website. Available at: https://vascular.org/patient-resources/vascular-treatments/surgical-bypass. Accessed November 30, 2017.